If the pollsters and bookies are right, then on 8 May, the results may be summarized thus: hung parliament, Conservative plurality, possible anti-Tory majority at Westminster, Tory majority in England. Despite the great uncertainties of the outcome, the campaign has felt a little flat, and the support for the parties remained broadly the same for months, even if some patterns such as the gradual decline of support for UKIP are observable. What is clear is that there has been no big election-winning shift, a break towards a particular party, even in the final weeks and days of the campaign. And throughout the campaign, both David Cameron and Ed Miliband seemed almost delusional in claiming – though perhaps and hopefully not believing – that there were chances of a majority government for the Conservatives or Labour respectively. The screenshots below – all taken around lunchtime – show graphs plotting the support for the Conservatives, Labour, the Liberal Democrats, UKIP, and the Greens. These do not reflect the outcome very well, because of the impact of the SNP in Scotland, but still useful as an indicative snapshot of support for different parties. However, what matters is how many seats parties win, not how much share of the vote they win. All pollsters and bookies that I have come across agree that the Conservatives are likely to emerge as the largest party, ahead of Labour. Though there are some variances in the projected gap between the Conservatives and Labour. The lowest projection for the Conservatives is found on the Guardian site at 276, whereas YouGov, Election Forecast (www.electionforecast.co.uk), and Electoral Calculus (www.electoralcalculus.co.uk) all put the number of the Conservative seats above 280. The difference between the highest number (283 on YouGov) and the lowest number (276 on Guardian) is 7. The figures for Labour and the Liberal Democrats vary more. The highest projected number of seats for Labour is 275 on Electoral Calculus and the lowest is 261 on YouGov, a difference of 14 seats which could be a crucial difference in terms of forming an anti-Tory majority without the Liberal Democrats. The highest projected number of seats for the Liberal Democrats is 32 on YouGov and the lowest is 18 on Electoral Calculus, also 14, suggesting some different interpretations of how the battles between Labour and the Liberal Democrats will turn out. The SNP is projected to win between 50 and 53 seats. The projections for UKIP range between 1 and 3. It looks like Caroline Lucas will hold on to her seat. And it seems that in England, the Conservatives may be on course to win an absolute majority (267 or more), which may have constitutional repercussions. 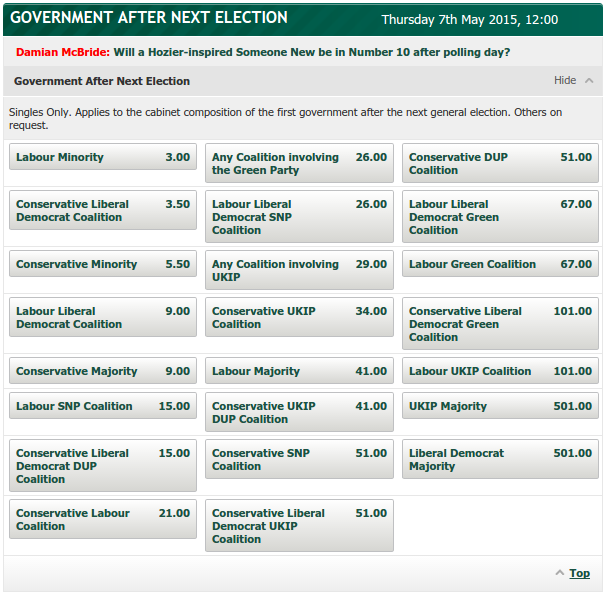 As for the composition of the next government, a Labour minority government is favoured by the bookies ahead of the current coalition of the Conservatives and the Liberal Democrats. Are the pollsters and bookies broadly right? Which projection will be the closest to the actual result? We will find out soon.